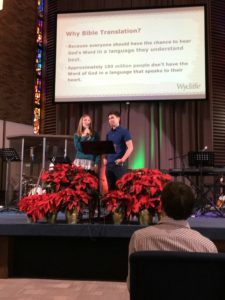 Yesterday, we officially were sent by our home church to go as missionaries. 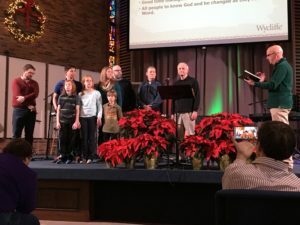 The advent service included an explanation of why the church commissions people to go as well as a charge and prayer over us as a family in addition to some great songs (Here for You, Oceans, O Come Emmanuel, and Take to the World) and a sermon on Isaiah 52:7. There was a delicious lunch after and we were so delighted to see so many wonderful friends, family and partners make it out on such a snowy morning! Pastor Joel giving charge to our family. We are truly in the home stretch now. 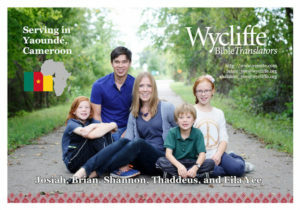 Praise God for 100% of our financial partnership team and launch expenses! Praise God for a good deal on plane tickets too. 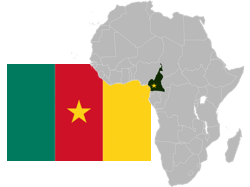 We plan to leave for France on December 30, 2016 and then head to Cameroon on July 25, 2017. 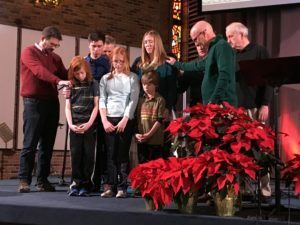 Please join us for our commissioning service at 10am this Sunday, December 11, 2016 at Bell Creek Community Church. There will be a delicious lunch following the service. All are welcome! -all people to know God and be changed as they read His Word.